During its six-year-long partnership with Nike, Manchester City has won six major trophies. This run of success is recognized with the limited-edition Nike x Manchester City 2019 Celebration jersey. The new mashup-styled City shirt may be the last from Nike for some time given that the defending English Premier League champions are switching to PUMA this summer. 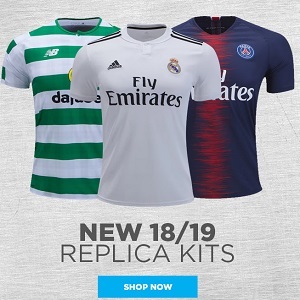 The design pulls from nine of the period’s iconic looks, including the 2017-18 centurion season home shirt worn by Kevin De Bruyne Raheem Sterling and John Stones, in which the club broke the Premier League points tally record, and the third shirt from the 2013-14 domestic double winning campaign that was worn by midfield lynchpin Fernandinho. The individually numbered (1 to 6,000) Nike x Manchester City 2019 Celebration jersey will be available April 1 at World Soccer Shop, UK Soccer Shop, Lovell Soccer, Pro:Direct Soccer, Subside Sports and Kitbag.